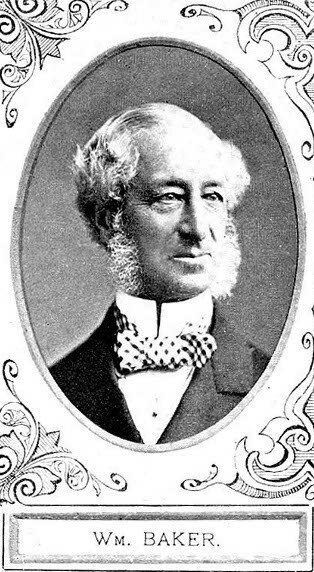 William Baker was born on 19th May 1815. In 1834 he was articled to George Watson Buck, who was then an engineer on the London to Tring section of the London & Birmingham Railway. He moved with Buck, in October 1837, to work on the Manchester & Birmingham. He finished his apprenticeship in 1839. Following completion of the M&BR in 1842 he became the Engineer on the Manchester South Junction & Altrincham as well as the Shrewsbury & Birmingham and the Shropshire Union Railways. He was elected as a Member of the Institution of Civil Engineers on 7th March 1848. In 1849 he was appointed Engineer of the Stour Valley line, which at that time was leased by the LNWR. Some time later he became Assistant Engineer on the North Eastern Division at Manchester under Henry Woodhouse (then Divisional Traffic Manager and Engineer). At the end of 1851, the Permanent Way, Works & Estate Committee promoted William Baker to the position of Engineer for the Southern Division at Euston, moving him from Manchester to stand in for R B Dockray, who was unable to work due to illness. His appointment was confirmed in November 1852 when Dockray resigned, having no prospect of returning to work. Although not responsible for new works throughout the system until 1859, William Baker began reporting regularly on the subject as part of the Directors’ half-yearly reports to the proprietors, starting with the half year ending 30th June 1853. New works projects in this period included Birmingham New Street station. The Board decided, at a meeting on 8th November 1855, that the Engineering should come under one head, referring the matter to the Works Committee to sort out the details, but the following month a subcommittee of the Executive was appointed to deal with the question. The first moves were made in January 1856, when the Northern and North Eastern Local Committees were amalgamated, with R S Norris continuing as the Resident Engineer for both areas, although the engineering for the Trent Valley line was transferred to William Baker. The Subcommittee eventually proposed that William Baker become the Engineer for new works and the related Parliamentary bills throughout the system. With the death, in 1859, of both Robert Stephenson, who was Consulting Engineer for the LNWR Southern Division, and Joseph Locke, Consultant for the Northern lines, William Baker was appointed Chief Engineer for New Works for the whole Company. He had assistants and staff based at Euston and Resident Engineers in charge of individual new works projects. During his period as Chief Engineer, many major projects were completed or started. These included enlarged stations at Euston, Liverpool Lime Street, which included the large station roof and new Hotel, Manchester London Road, the large overall roof at Birmingham New St, Preston, Bolton, Crewe, Warrington and Stafford. New lines included the Birdswood Junction to Ditton line crossing the Mersey via the Runcorn Bridge. He was also responsible for widening works at many places. Besides his work on LNWR lines, he acted on behalf of the LNWR as consulting engineer for the West London Extension between 1859 and 1863, and for the North London between 1863 and 1866. He was also the Engineer on a number of lines built jointly with the other railways and was responsible for the construction of the Dundalk, Newry & Greenore Railway and the Dublin North Wall Extension. On 20th December 1878 William Baker died aged 63, while still in the Company’s employment. He had served the LNWR in various positions for over 29 years. Webb Precursor No 779, completed in February 1879, was named William Baker in his memory.